Lights hidden in faceted crystal buds. 39"Dia. x 19"T with 10'L chain and 7"Dia. ceiling canopy. Weight, 44 lbs. Boxed weight, approximately 53 lbs. Quinn Braided Picture Frame, 3.5" x 5"
Chandelier made of metal and glass. Dressed in myriad hand-cut crystals. Polished chrome finish. Uses nine 60-watt bulbs. Mounting hardware and 5.25"Dia. ceiling canopy included. Direct wire; assembly and professional installation required. 28"Dia. x 27"T with 72"L chain. Imported. Weight 32 lbs. Boxed weight, approximately 40 lbs. 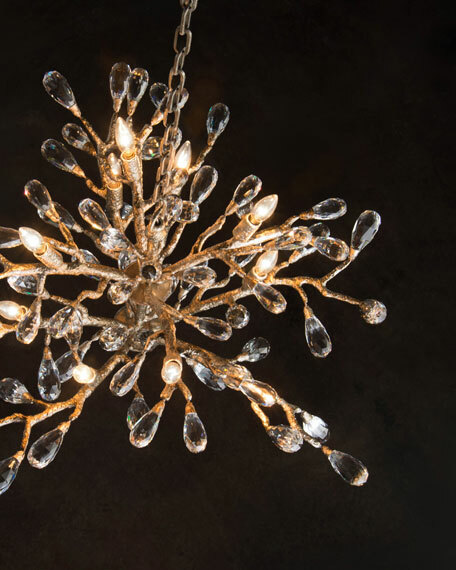 Handcrafted chandelier with quartz crystal details. Iron frame finished in gold leaf. Uses nine halogen type-G 25-watt bulbs (included). Overall: 28.5"W x 29.5"D x 28"T. Canopy: 6"Dia. x 1"T. Chain: 10 ft. Cord length: 10 ft. Imported. Weight, 32 lbs. Boxed weight, approximately 40 lbs. Chandelier features a veiled quatrefoil drum shade and glass ball pendants. Handcrafted of iron, metal, and glass. Antiqued Parisian-silver finish. 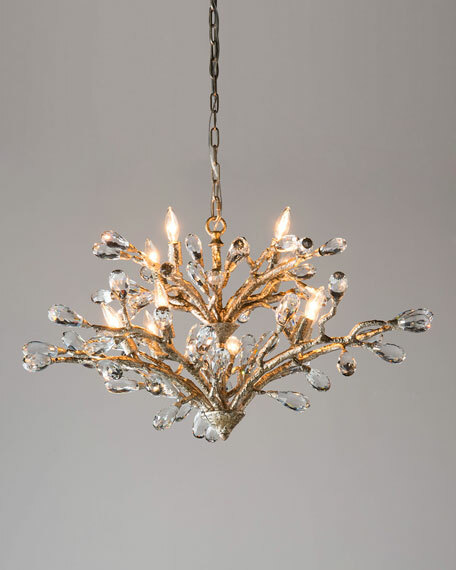 Chandelier features a veiled quatrefoil drum shade and glass ball pendants. Handcrafted of iron, metal, and glass. Antiqued Parisian-silver finish. Sheer silk shade. Ceiling canopy included. Direct wire; professional installation required. Uses nine 60-watt bulbs. 40"W x 40"D x 36"T with 10'L chain. Imported. Boxed weight, approximately 52 lbs.